Published on February 25, 2016 in Crime in T&T, General T&T, Media, Murder and Violence. 5 Comments Tags: Crime in T&T, Newsday, Politics, T&T Govt. 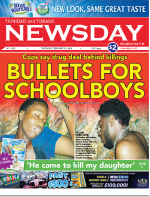 TWO teenaged schoolboys were shot dead in a lonely, bushy track off St John’s Road in St Augustine on Tuesday afternoon in an incident police investigators say was linked to a drug deal which had gone sour. The victims have been identified as Daniel Hall, 16, of Tunapuna and Stephan Singh, 17, of Enterprise, Chaguanas. Hall was a Form Four student of the Aranjuez North Secondary School and school officials confirmed that he had attended classes on Tuesday prior to being murdered. Singh sources said, attended the St Augustine Secondary School. Police officers who were called to the scene after residents of St John’s Road heard rapid gunfire, came across the bodies of Hall and Singh, with the latter suffering a gunshot wound to the back of the head. Hall was found with a .38 revolver stuck in his pants waist. Police were yesterday trying to ascertain if the schoolboys had criminal records and/or court cases. Officers responded and found the bodies of Singh, 17 and Halls, 16. Police said they were told that the teens were seen as part of a group of five entering the bushes and after the shooting only the two deceased were found. Singh, a student of Trinity East College, had an empty revolver on him. HOURS before teenaged students Daniel Hall and his close friend Stephan Singh were murdered on Tuesday, Hall had a frank discussion with one of his associates from a gang, pleading with him not to implicate Singh in the fire-bombing of a vehicle. The death toll stood at 77 and shows no trend towards decreasing. The youths involved in this wild Wild West incidents were known to possess weapons for some time. This would have been a great opportunity for police and army to conduct raids on these gang leaders homes and take them in for interrogation. Instead they are being treated with “kids gloves”. Surely Dillion and the CoP must have the names of the gang leader and members involved in such high level of criminality coming from the East West Corridor. respect, perks and esteem which their positions entail, they themselves do not fulfill the purposes for which religion has willfully produced in the past. Religion does not and cannot provide the lead for nation building as our past history so evidently did. Government need to encourage family and community to develop our children. Religion is a personal commitment to culture and social acceptability NOT education, in today’s world. We need to develop avenues to correct our young children when they show signs of going astray. Such intervention must address academic needs, social needs and national needs as well. No amount of prognosticating about who will take part and who would not take part must be tolerated in such discussions. It is a need that must be addressed. This medium does not allow the many needs we have to address to re-direct the failures we now have in our system.